EIEE1-19. Online Mendelian Inheritance in Man (OMIM) is one of the most frequently accessed online databases for information on genetic disorders. Genes for epileptic encephalopathies are organized within a phenotypic series entitled Early Infantile Epileptic Encephalopathy (EIEE). The EIEE phenotypic series currently lists 19 genes (EIEE1-19). Let’s review the evidence for these genes as of 2014. 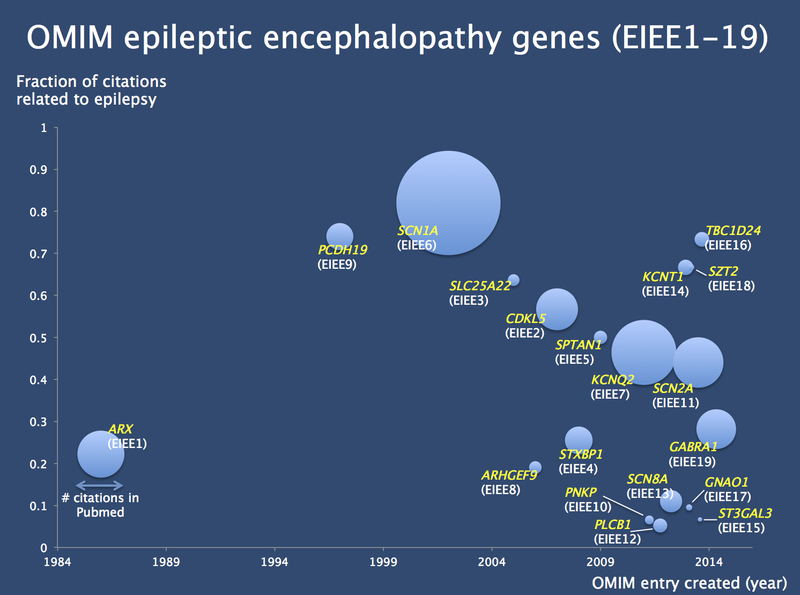 The OMIM epileptic encephalopathy genes plotted by year of data entry into OMIM (year of establishing the OMIM entry) versus the fraction of PubMed publications related to epilepsy compared to all publications for a given gene. The diameter of the bubble refers to the number of epilepsy-related publications for a given gene. It is obvious that this chart is strongly dominated by SCN1A, highlighting the role of this gene for human epilepsies. EIEE1 – ARX. The ARX gene is associated with a broad range of neurodevelopmental disorders and malformation syndromes. Polyalanine expansions within ARX can cause Infantile Spasms. ARX was considered one of the major candidates for Infantile Spasms. The frequency of ARX mutations, however, appears to be relatively low. EIEE2 – CDKL5. Mutations in the CDKL5 gene were initially described in patients with atypical Rett Syndrome. It is established as one of the major genes for early onset epileptic encephalopathies. EIEE3 – SCL25A22. Recessive mutations in this mitochondrial glutamate transporter cause a very severe, early onset epileptic encephalopathy that presents as Ohtahara Syndrome, Early Myoclonic Encephalopathy or Migrating Partial Seizures. Here’s the link to our recent blog post. EIEE4 – STXBP1. Initially described in patients with Ohtahara Syndrome, STXBP1 has become one of the most prominent genes for epileptic encephalopathies. We have written about this gene coding for a synaptic vesicle protein in this blog post. EIEE5 – SPTAN1. De novo mutations in the gene coding for nonerythrocytic alpha-spectrin-1 are a very rare but recurrent cause of epileptic encephalopathy. The full phenotypic spectrum is not yet understood and might include spasticity, intellectual disability, hypomyelination, and pontocerebellar atrophy. EIEE6 – SCN1A. The gene coding for the alpha-1 subunit of the voltage-gated sodium channel is by far the most prominent gene for epilepsies. The classical phenotypes include Dravet Syndrome and Genetic/Generalized Epilepsy with Febrile Seizures Plus (GEFS+). Also, common variants in SCN1A might predispose to more common epilepsies such as the Genetic Generalized Epilepsies and Temporal Lobe Epilepsy. EIEE7 – KCNQ2. Initially described as the gene for Benign Familial Neonatal Seizures, dominant negative de novo mutations in this gene are also found in epileptic encephalopathies with neonatal onset. EIEE8 – ARHGEF9. Prior to assembling this list, this gene was virtually unknown to me. Mutations or deletions in this gene may result in intellectual disability, hyperekplexia and epilepsy of varying severity. There are very few patients described, and the phenotype is variable. It is difficult to assess whether mutations in ARHGEF9 are related to epileptic encephalopathies. No mutations in this gene were found in a larger gene panel study, indicating that epilepsy-causing variation in this gene, if present at all, is very rare. EIEE9 – PCDH19. Mutations in the X-chromsomal protocadherin gene were first found in families with epilepsy and intellectual disability limited to females. Since then, it was found in female patients with SCN1A-negative Dravet Syndrome, even though the phenotype might be slightly different. EIEE10 – PNKP. Recessive mutations in this gene coding for a DNA repair enzyme cause epileptic encephalopathy, microcephaly, and progressive spasticity of the lower extremities. So far, only few cases have been described, but gene panel studies may detect further patients. EIEE11 – SCN2A. The SCN2A gene has followed a similar trajectory as KCNQ2 – it was initially found in a benign familial epilepsy syndrome and has subsequently emerged as a major gene for epileptic encephalopathies. In addition, de novo mutations are found in patients with autism and intellectual disability. This is our recent post about this genetic shapeshifter. EIEE12 – PLCB1. Homozygous deletions in the gene coding for phospholipase C beta 1 were found in two families with severe, early onset epileptic encephalopathies including Malignant Migrating Partial Seizures of Infancy (MMPSI). EIEE13 – SCN8A. De novo mutations in SCN8A are a rare cause of epileptic encephalopathy and intellectual disability. The SCN8A protein is basically the counterpart to SCN1A – the SCN1A gene is mainly expressed on inhibitory interneurons, while SCN8A can be found in excitatory neurons. Therefore, in contrast to SCN1A, it is likely that epilepsy-related mutations are gain-of-function. EIEE14 – KCNT1. De novo mutations in KCNT1 are the major cause of Malignant Migrating Partial Seizures of Infancy (MMPSI). This is our blog post on the KCNT1 gene. EIEE15 – ST3GAL3. Mutations in this gene have been found in a single family with recessive inheritance and epileptic encephalopathy as a phenotype. It is currently not clear whether this mutation is causative or unrelated to the phenotype. Read our blog post here. EIEE16 – TBC1D24. The first epilepsy gene to be identified with next generation sequencing has a broad phenotypic range – recessive mutations were found in two families with epileptic encephalopathies. Read our blog post on TBC1D24 here. EIEE17 – GNAO1. De novo mutations in GNAO1 were found in patients with Ohtahara Syndrome and other epileptic encephalopathies. This is our blog post on this gene. EIEE18 – SZT2. Two patients with recessive mutations in SZT2 have been described. The phenotype included epileptic encephalopathy and corpus callosum dysplasia. The initial study suggested that this gene is a promising candidate gene, but further studies may be needed. EIEE19 – GABRA1. As described in a recent blog post, de novo mutations in this gene may cause Dravet Syndrome. GABRA1 codes for a GABA receptor subunit, and mutations in this gene were previously identified in a family with Juvenile Myoclonic Epilepsy. Conclusions. While the OMIM EIEE list is generally comprehensive and well curated, I would have several comments. First, some EIEE genes have insufficient evidence to be securely labelled as genes for epileptic encephalopathies. These include ARHGEF9, ST3GAL3, and SZT2. Also, some known genes such as CHD2 are not mentioned in this phenotype group. In fact, CHD2 has its own phenotype group called Childhood Onset Epileptic Encephalopathies (EEOC). This distinction points out the limits of the OMIM classification, as many of the epilepsy phenotypes are overlapping and are difficult to box into specific categories. The original table from which the figure was derived can be found here. This entry was posted in 2014, Epileptic encephalopathy, EuroEPINOMICS and tagged ARHGEF9, ARX, CDKL5, CHD2, Dravet Syndrome, Early Myoclonic Encephalopathy, EME, encephalopathy, epileptic encephalopathy, GABRA1, GNAO1, Infantile Spasms, KCNQ2, KCNT1, Malignant Migrating Partial Seizures of Infancy, MMPSI, OMIM, PCDH19, PLCB1, PNKP, recessive mutations, SCN1A, SCN2A, SCN8A, SLC25A22, SPTAN1, ST3GAL3, STXBP1, SZT2, TBC1D24. Bookmark the permalink.